Finalist in the 2018 Book Pipeline season, Darlene Parris Young’s introspective autobiography Unzipped shines a rare and candid light on an industry most know little about. Her oftentimes heart-wrenching story highlights a crucial time in the NYC world of fashion and the hurdles she faced for decades as a model, compounded by an array of troubles that make her a true survivor. I know the cliff notes version won’t do it total justice, but. . . in a nutshell, what was it like being a fashion fit model in an era immensely different from the present day? Or was it that different? How have you seen the industry evolve from the day you started to now? Concerning social dynamics in the modeling industry, I have seen quite a few changes in the last 50 years. As a fit model, we were called “coat hangers” by trade, as well as being considered independent contractors. With neither a boss nor an HR department to protect us, we were vulnerable to sexual harassment as well as being excluded from present labor law protection. However, I am starting to see the pendulum swing in the other direction. In a way, I can somewhat understand why a model agency might not want to compromise their relationship with the big Garment Center manufacturers, as the manufacturer generates business for decades. On the other hand, models come and go. Regardless, agencies should have a deeper responsibility toward their models and encourage the model to report inappropriate behavior. Most of the past harassment reporting came from seasoned professionals like me. We already had a following—we have helped the manufacturer make money, and thus we can take more risks and be outspoken. Today, I find it exciting to talk to this younger generations of girls because they are not so naïve. They are being taught that there are predators in every facet of the workplace. They are sharing their stories and reporting misconduct. Just like Harvey Weinstein and other predators who have been brought down, so can anyone who makes your job intolerable because of their behavior. As a writer venturing into new territory, why decide to move forward with Unzipped? Did your expectations of the writing process differ from the reality of it all? Fit modeling is a career few people know about, yet it has been a fascinating one. At the same time, for all the rewards it has brought me, it has come at a cost. I was frequently subjected to sexual harassment and even raped in the course of my work. And while my career brought me confidence, it took me years to bring that confidence home with me, as I endured emotional and physical abuse by some of the men I had loved. So it was important for me to write a book that would reach not just women who have an interest in modeling, but women who are struggling to find their own place in the world. When I was a young housewife, I never would have dreamed I’d have the career I have had, and so I stayed with a man who abused me–it never occurred to me that I could make it on my own. I want women to read my book and realize that they don’t have to be abused, they don’t have to stay with men who treat them badly, and that they may well have a future–no matter what their age–that they had never imagined. Regarding my early expectations vis-à-vis the “reality” of writing, nothing prepares you for the journey. I began believing that my book would be a fait-accompli, never imagining the hours of writing, the emotional hurdles of remembering events that I had forced myself to forget, and the discipline needed to remain focused. Then, when I thought I was at the finish line, I discovered that I would need a professional who was not only an accomplished editor but a genius in creating the documentation needed for submittal to an agent. Did you receive pushback from family? From friends or associates you worked with? Or, one would hope, were you wholly encouraged to take on the burden of writing such a personal story? When I initially went into my den and began to write, I doubt if my children or my husband understood. It was during this period, however, that I began to appreciate my husband of four or five years, for he was the one constant in my process, the one who encouraged me and had faith in me. Explain what it’s been like trying to find an agent, how you’ve traversed the publishing world. The process of finding an agent is not for the timid of heart. It is equally as tough, if not more so, than writing your work. First, you learn what a “query” is and how to fashion it to each agent you solicit (that becomes an art unto itself). Second, you tailor your formal proposal, bio, and other works to interest the agent you are querying. Last, and most importantly, you need to remain positive when you’re told, “Your work sounds very interesting, but I don’t think I am the right agent for it.” Most times, the agent does not even have the time to send a regret email. Of all the tasks over the past three years, finding the right agent can be the most stressful and tiring process. Finding Mary Ann Karinch of The Rudy Agency was my final reward. Without going into too much detail–the harrowing moments are explained in Unzipped, which hopefully everyone will get to read soon–how did you find the motivation to keep pressing ahead in fashion? Financial constraints, the weight of responsibility, all that, sure. But was there a personal reason as well? Did you believe you had something to prove to yourself and your peers? Wow, that’s a lot to tackle! When a woman is attacked, her life changes forever. Trust is replaced by suspicion, and when you are forced to smile, it’s fake. The feelings of loneliness and fear are with you every day. Every woman who has been attacked needs professional help in order to recover. Recovery, many times, merely means managing each day. As a model, there are constant triggers to abuse. Our bodies are our livelihood, and we don’t have the same expectations of privacy that most women have. We are touched and turned and measured and gazed upon and critiqued constantly, which can be very challenging for a survivor of sexual assault. Being in the same workplace every day, that workplace that might have been a part of the stimulus, was not easy. But I had worked every day since I was 17. I had supported my son and daughter without much assistance from their father. And, thankfully, I was good at what I did and that translated into being in demand, always. So as challenging as my work was, the work itself also became a time of salvation that demanded I concentrate on something other than my attack. My work also afforded me the belief that my life still had purpose. When penning a memoir, where you know every detail of every moment of the last several decades, how do you decide what to include and what to cut? Do you hold back on anything you feel is too personal, or do you try and lay everything out on the table? I was very fortunate in finding Janice Harper, my editor. We formed a fantastic creative working relationship where all I had to do was express what I had to say, and Janice polished my words to the point that they sang. Unzipped lays bare my life. I held nothing back. My original intent was to do more than just write about my modeling career, but also to help women overcome their fears resulting from abuse. Thus, I needed the reader to understand that whether they are a model or not, they are not alone in their sorrow and struggle. The goal of the book. What are you looking to accomplish? Is this a cautionary tale in some ways? Or is it at least fair for a reader to interpret it as such? The goal has remained the same throughout the process: to inspire women to believe in their own possibilities. Is it a cautionary tale? I hope so. However, the book does not lay out the dos and don’ts of social behavior. It tells instead a vivid story of what can go wrong in both our professional and personal lives, but that we have within us the power to protect ourselves, stand up for ourselves, and transform ourselves. 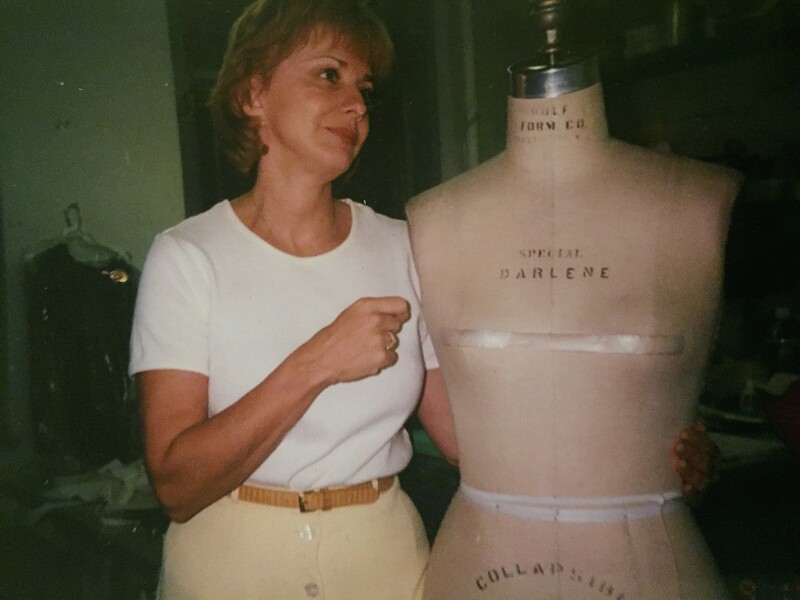 For nearly half a century, Darlene Parris Young had a successful career in the modeling industry, gracing the covers of magazines and walking the runways. But Darlene’s real calling came as a fashion fit model–working behind the scenes as a living mannequin for designers who would use her body as a template for their fashions. Darlene became known as “The Coat Hanger with a Mouth!” for her outspoken interactions with designers as she explained what women want in clothes. Behind the scenes at home, however, it was a different story. Surviving a violent and emotionally absent father, and later a series of abusive husbands, Darlene’s transformation from victim to a voice for women took years. Throughout these marriages, Darlene relived her trouble relationship with her father, a World War II decorated war hero so damaged that it was only after a spiritual awakening and a near death experience (NDE) at sea to understand that her journey to heal from abuse was not so unlike her father’s unsuccessfully quest to heal from the wounds of war. Unzipped: Chronicles of a Fashion Fit Model focuses on her career as she worked for top designers including Diane von Furstenberg, Ralph Lauren, and Chanel, traveling the globe with celebrities, struggling to find love.